3. Using a pastry cutter, cut in butter. 4. Lightly beat the egg with the vanilla, then stir into batter. 5. Add scalded milk and yogurt and mix only until combined. 6. Fold apple into batter. 7. 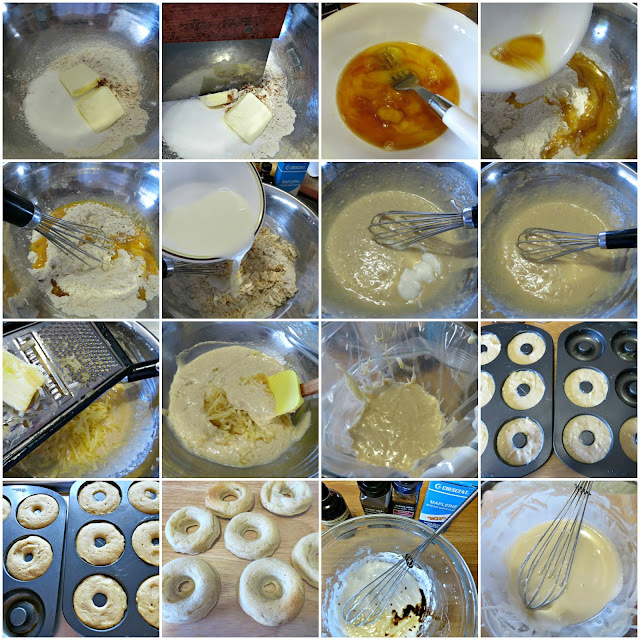 Use a piping bag to fill doughnut pans about ¾ full and bake for 18-20 minutes or until the tops spring back. 8. Glaze: Whisk all ingredients together, and adjust consistency using milk and powdered sugar. 9. After letting doughnuts cool for about minutes, dip warm doughnuts in glaze and let set. I did my taste test and indeed it was close- but better because of the maple glaze! I used only a quarter cup of sugar for the batter so the donuts came out with just the right amount of sweetness. Oh, man! I didn't get to even taste a crumb of these beauties :( The zucchini brownies were divine though. I guess I need to be thankful for the 20% of your creations we get to enjoy and cherish at work. Rats! But I really want one of those apple doughnuts right now!!!! !